Months of intense resistance by ordinary people in Greece appear to have resulted in a partial victory. The EU crisis summit conceded that bond holders be forced to shoulder 50% of their losses. This did not come easy, Greek workers have staged several general strikes and Athens has seen day after day of large scale rioting. The contrast with Ireland is clear. Here the union leadership called off token resistance in the first months of the crisis and workers passively marched, shrugged their shoulders and went home. 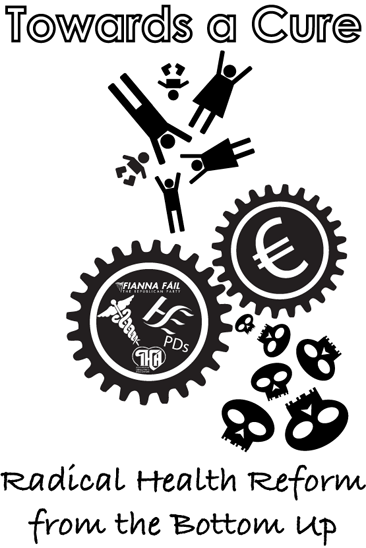 As a result the ordinary Irish worker alone, the majority of 'the 99%', have shouldered all the costs. Bond holders will scontinue to have their failed gambles covered. Next week alone another 700 million will be handed over to the Irish & global 1% to cover their losses in Anglo. This is our ‘thanks’ for being the poster boys for austerity across Europe. It is true that the intention is still to impose further vicious rounds of austerity on workers in Greece. So this partial victory is only that but hopefully it will give heart to those who have fought and are continuing to fight to resist those intentions there as well as being a lesson on how resistance is fertile to those of us in Ireland. The details of how the EU will finance the bailout are dodgy to say the least, running from a reliance on China to lend the needed funds to the construction of another round of mysterious ‘Special Purpose Investment Vehicles’ designed to turn the debts into attractive investments. Despite this the Stock Markets have still initially welcomed the new deal, presumably out of desperation and relief that the next stage of the crisis has been once more postponed. The markets probably particularly like the further undermining of parliamentary democracy in Europe contained in what is proposed in the deal. Economist Engelbert Stockhammer pointed out in his analysis of the deal that under these proposals if deficits are not cut “some tribunal of the European commission and wealthy European governments will get powers to dictate economic policy in the deficit countries.” This continues the long pattern of the EU treaties where even the limited democracy of parliaments is displaced by neoliberal economic orthodoxy imposed by technocrats. With these deal we are promised with a Trokia for every country in the audience. Irish media discussion of the Greek bailout has tended to focus on whether it is ‘fair’ that 50% of the Greek debt is being cancelled when Ireland has already changed much of the (private) bank debt into (state) sovereign debt and is still expected to repay it all. Whether it is fair is neither here nor there, Greek workers forced these concessions through months of hard resistance, our reluctance to fight not very surprizingly translated into an inability to win. Leaving aside the reality that the Greek state was unable to impose further cuts on Greek people without risking revolution this ‘fairness’ question accepts the limits of discussion that have become established and unquestioned. In Ireland as in Greece the enormous debts did not result from money being pulled out from under local mattresses to put in the banks to lend to property speculators. Rather the banks saw a huge influx of global money, running to hundreds of billions, because the speculative bubble created by that money in Ireland & Greece offered far greater returns that those on offer in Germany or France at the time. When that money was flowing into Ireland & Greece the wealthy 1% who were investing it insisted that it was their private property to do with as they please. There was no talk of sharing the massive profit’s generated and everything possible was done to avoid paying tax on those profits. It was only with the crash that the 1%, whether Greek, Irish or global insisted that the debts were suddenly public and national. In the boom workers in Greece or Ireland never stood to gain anything more than the crumbs that fell from the table, in the bust all the costs are somehow to be ours alone. This underlines that the crisis is not Irish or Greek but global and is not a crisis of corruption, or poor investments but one of capitalism. Our resistance cannot be national but must be global and aimed not simply at a ‘fairer’ distribution of the costs but at a transformation of the world economy. A transformation that would take control and profits out of the hands of the '1%' and into the hands of the 99%. The resistance in Greece shows that the 1% are not all powerful and is an example that can be built upon and spread across Europe & the globe.